First of all, I am posting here after a long time. My author website, http://www.amarvyas.in is undergoing some redesign, and I thought it would be great to catch up with this site, and reconnect with some of the folks I had interacted with. These days, I am looking at the market for book translations with interest, particularly so for major languages of India. Being the world’s second most populous (and soon to be world’s most populous) country having a multitude of languages offers a tremendous opportunity for translating books. Many of you may know that Hindi, Bengali, Tamil, Telugu, Marathi languages have over 70 million speakers each, that is, each of these languages represents a market that is equivalent to the population of Germany! 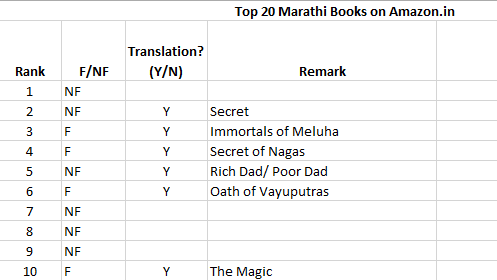 As I was going through the bestseller list for two of these languages, Hindi and Marathi on Amazon.in, I noticed something interesting: Nearly 40% of the books in bestseller lists are translations of English language books. This is true for both Fiction and nonfiction, and also for Foreign or Indian authors. 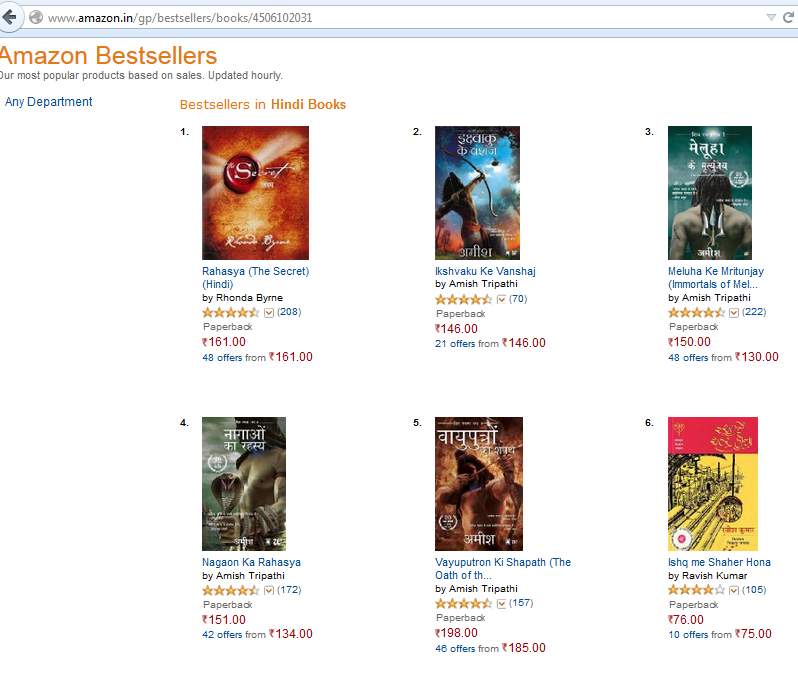 For Hindi print books, the top 5 in the list are translations! There could be several factors for this: discounting or marketing push by publishers, new books by the said authors, and so on. In the next day or two, I will post more on this .